New Jersey Theatre Alliance, in partnership with the New Jersey Performing Arts Center (NJPAC) and Newark Celebration 350, invites the public to a reading and discussion of Indian Head, a play-in-progress by OBIE Award-winner Nikkole Salter, on Friday, May 20th at 7:00 p.m. in the Chase Room at NJPAC in Newark. Indian Head is one of three new plays by New Jersey playwrights about New Jersey issues commissioned this year through the NJPAC Stage Exchange program. The play is about a fictional Parsippany high-schooler whose activism turns dangerous when she sabotages the mascot during a football game. It’s also a story about clashes and reunions, between cultures and within a family. Nikkole Salter is an OBIE Award-winning actress and dramatist. Her plays include In The Continuum (New York Outer Critics Circle's John Gassner Award for Best New American Play, 2006; Helen Hayes Award, 2007), Repairing a Nation, Of Great Merit, Carnaval, Lines in the Dust, and Freedom Riders. Salter is a 2014 MAP Fund Grant recipient, a Theatre Hall of Fame Seldes-Kanin Fellowship awardee, and a recipient of the Global Tolerance Award from the Friends of the United Nations. The event on May 20th at NJPAC includes a reading of the script by professional actors, followed by a panel discussion and open Q&A, where audience members can share their perspectives on Native American tradition, tribalism, and mascot controversy. Panelists include playwright Nikkole Salter; Rev. John Norwood, Nanticoke Lenni-Lenape Tribal Councilman and Principal Justice of the Tribal Supreme Court; Ryan Victor “Little Eagle” Pierce, artistic director of The Eagle Project and member of the Nanticoke Lenni-Lenape tribe; Tony Dearing, Local Content Director at nj.com/The Star Ledger; and Tricia Bloom, curator of the Art of the Americas collection at Newark Museum. As part of the NJPAC Stage Exchange program, Salter is working with Luna Stage Company, a professional theatre in West Orange that will present a full-scale production of Indian Head from February 2 to March 5, 2017. Admission to the reading is $5, and proceeds will benefit the Newark Museum’s Art of the Americas Collection, which includes 4,500 objects of Native North American art and Latin American art from the pre-Columbian era to the present. The museum’s Native American Collection will undergo a major reinstallation in the fall. Tickets can be purchased at njpac.org/events/detail/njpac-stage-exchange-the-commissions, or by calling 1-888-GO-NJPAC (1-888-466-5722). 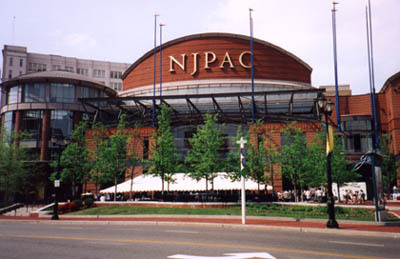 NJPAC is located at One Center Street in Newark. Now in its second season, NJPAC Stage Exchange: The Commissions (NJStageX) is collaborating with three professional New Jersey theatres to commission and produce new plays by a talented trio of Garden State playwrights. Following their staged readings at NJPAC in the spring of 2016, each new work will receive a full production during the 2016-17 season at the partner theatres. The selected playwrights and theaters include David Lee White and Passage Theatre Company (Trenton); Nikkole Salter and Luna Stage Company (West Orange); and Chisa Hutchinson and Writers Theatre of New Jersey(Madison). More information is available at: njtheatrealliance.org/NJStageX-2016. There is a strong community engagement component to NJStageX with proceeds from the staged readings going to New Jersey-based non-profit organizations and institutions whose missions complement themes and issues addressed in the plays. Each reading will be followed by a free symposium, made possible by a generous grant from the New Jersey Council for the Humanities, where the playwright will be joined on stage by a panel of academics, activists and professionals to discuss the issues in the play. Founded in 1981, New Jersey Theatre Alliance is the first statewide organization for professional, not-for-profit theatre companies in the United States, and is a leader in developing model programs that unite, promote, strengthen, and cultivate professional theatre in New Jersey. Funding for New Jersey Theatre Alliance, a not-for-profit organization, is provided in part by the New Jersey State Council on the Arts/Department of State, a Partner Agency of the National Endowment for the Arts, as well as contributions from individuals, corporations, and foundations including the Geraldine R. Dodge Foundation, Bank of America, Prudential Foundation, and The Horizon Foundation for New Jersey. More information can be found at njtheatrealliance.org. Pirates invade the Growing Stage!